An aquarium is perfect for adding to a study, a library or a dining room. They’re almost meditative to watch and create a truly peaceful and relaxing atmosphere wherever they are. This is why you so often find aquariums in hotels, waiting rooms, spas and restaurants. And because they don’t require the constant attention of a cat or dog, they’re a great choice for company if you’re a young professional or you just don’t have the time for other pets. But there are a few things you need to consider on a regular basis to keep your fish happy and healthy. And chief among these considerations is their food. Like any other pet, you need to feed your fish regularly in order to ensure they don’t go hungry – and that can sometimes be tricky if you’re very busy, or if you’re going out of town. This is where a fish feeder like the Current USA 3860 Aquachef comes in. 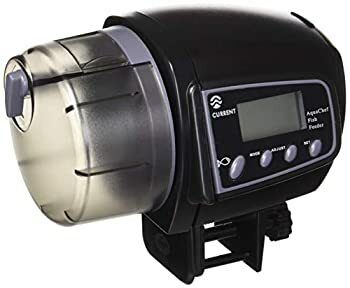 This is a highly affordable device, that nevertheless includes a number of very thoughtful features to make looking after your fish even easier. The Aquachef is programmable and allows you to set four feeding times per day. That’s enough for most applications, but if you do need more then you may wish to consider some of the other products we’ve looked at on this list. When the feeder does feed your fish, it will do so from a particularly large food reservoir. This is a great selling point of the Aquachef and makes life much easier – storing up to 35 grams. The hatch style feed door is adjustable, which means you can choose how much food you want to release at each feed. And on top of all that, the Aquachef also benefits from being very easy to install with a universal fit. It looks good too!